Exa FM Monterrey en Vivo . XHSR FM is a station in Monterrey, Nuevo León. 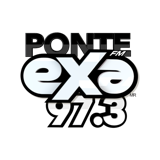 It broadcasts on 97.3 FM and carries the Exa FM Contemporary Hit Radio format from MVS Radio.